Who says art and technology cannot mix? Paintbrushes will soon hit antique stores near you, it seems. 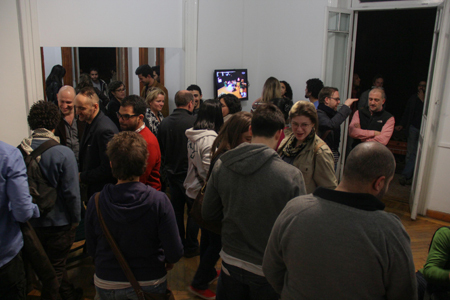 Digital and installation art has taken over the scene worldwide and is now penetrating Egypt’s art landscape. An Egyptian cultural organisation and gallery dubbed Medrar for Contemporary Art played host to an ultra-experimental new media art exhibition entitled InterLAB: Artificial Emotional Intelligence on 22 and 23 February, in which a group of Egyptian visual artists, web developers, and programmers collaborated with a parallel group in Dresden, Germany to create a series of installations that connect gallery dwellers in both cities. In the aftermath of the January 25 Revolution, cultural events planned for Fridays often suffer from cancellations or low turnouts due to protests and occasional clashes in the city, but this exhibition was an exception. The sit-in at Tahrir Square, minutes from the venue did not stop art enthusiasts from spilling into Medrar. The exhibition, which took place at a Dresden gallery simultaneously, featured communication devices designed entirely online by the cross-cultural group made up of two interactive art collectives: OpenLabEgypt and Germany’s Kasoosh. 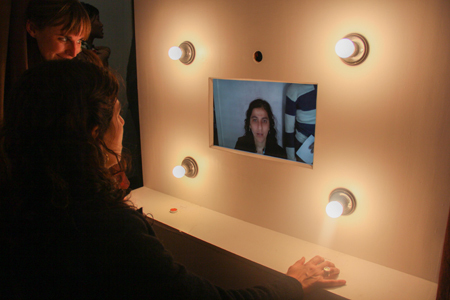 Taking hyper-connectivity to a whole new level, the innovative communication installations range from electric fans that start spinning when a gallery visitor in Dresden picks up the phone, to photo booths that integrate your face with a German sitting in a similar booth, to a “family portrait” projected across the wall, made up of still images of InterLAB participants in both cities. “Everything has become a communication device, the lights, the fans, and every installation,” explains one of the Egyptian new media artists and member of OpenLabEgypt, Yasmin Elayat. “Visitors are invited to play around with the installations and test the communication devices,” she says. A two-month online workshop, with five participants from Cairo and five from Dresden, took place before this two-day exhibition. 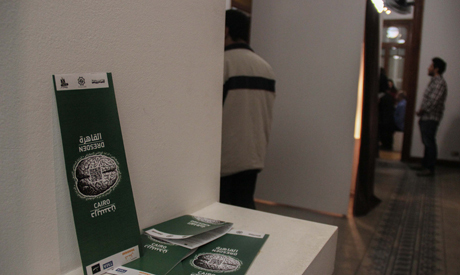 Along with illustrating the collaborative efforts of the cross-cultural team, the exhibition depends on the interaction of Cairo’s public with its Dresden counterpart. “The whole project is built on collaboration between here and Germany, and it was prepared entirely online,” Diaa Hamed, project director at Medrar told Ahram Online over the buzz of the raucous crowd. Cairo Hackerspace, an initiative composed of young Egyptians working with technology to create projects that could range from building a robot to a new cooking recipe, helped with the electronic logistics of the exhibition, facilitating the communication between the galleries in the two cities. A box-shaped device dispenses a spray of fragrance when someone in Dresden enters the space. And when you walk into the gallery in Cairo, it triggers a light bulb on the corresponding gallery’s door. “If the light bulb comes on, you know that someone was walking with you, but in Egypt,” explains Omar. When one of the gallery visitors knocked over a piece of equipment, Omar smiles. He says they have been living in the gallery for the past two days, troubleshooting and fine-tuning the devices. An experimental air sweeps through art space, as installations trigger your curiosity and invite you to try them out. The fan suddenly softens the thick air. Someone had picked up the phone in Germany. Refreshingly, the space is not painstakingly neat, as you would usually experiences in a typical art gallery. On the contrary, there is a fluidity and haphazardness to the exhibition that charms and excites. There is no dearth of malfunctions with the devices either; the family portrait seems to be stuck in place, the screen showing the Dresden gallery via Skype looks as if it has been set to play in slow motion. But the artists take it in stride and blame it on Egypt’s slow internet connection. El-Shaer is particularly fond of the photo booth. He says the idea is that you let the camera take your picture and save it in the database, and then you choose one of the photos from the library of German faces, to combine with your own face, like a mask. There is a parallel booth in Dresden, as the entire experience is lived in real time, explains El-Shaer. “The idea is to exchange action between us and them,” El-Shaer says. InterLAB will make another appearance during the D-CAF festival at the Medrar Gallery and at the vintage Hotel Viennoise this April, where the exhibition will be further developed, and the German artists will make a physical appearance.